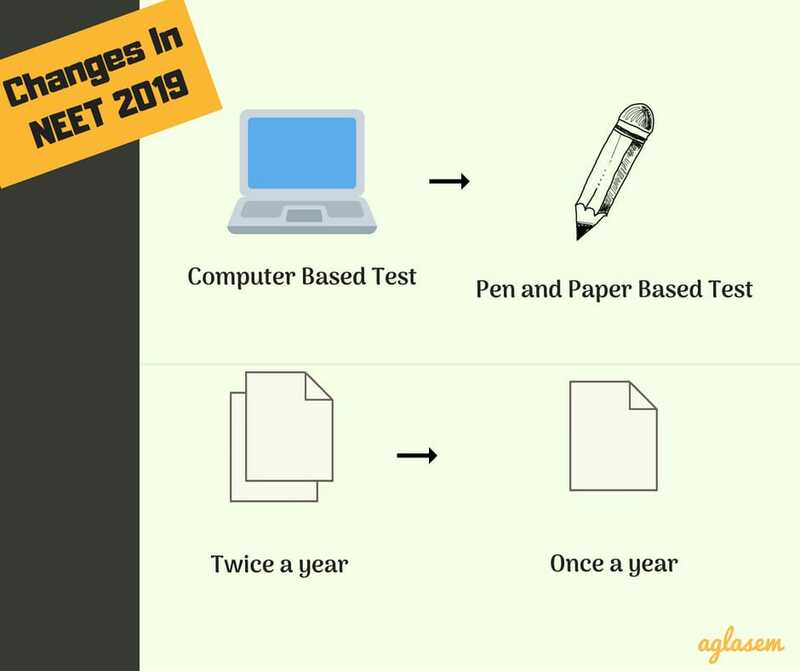 NEET 2019 Changes – From the upcoming year, 2019, NEET examination will be conducted by National Testing Agency (NTA). Previously is was conducted by CBSE. The NTA is an autonomous and self-sustained body formed to ease the conduct of entrance examinations. Students can go through this page to find out about NTA and the changes that will be implemented. Students have welcomed the new rules of NEET 2019. Candidates can also share their opinions on NEET 2019 changes in comments below. A lot of changes were planned to be introduced from NEET 2019. But now they have been cancelled. Instead, NTA may introduce these changes from NEET 2020 exam onwards. Given below are the changes, new rules. Conducting body – The major change in NEET 2019 will be the conducting body. Till now, the NEET examination was being conducted by the Central Board of Secondary Education. But from next year onwards, the responsibility of conducting the NEET examination will be in the hands of National Testing Agency. Mode of exam: Until last year, CBSE held NEET exam in offline mode. Then in July 2018 MHRD announced that NEET will be in online (computer based test) mode from 2019 onwards. However now the change stands cancelled. Once again exam will be in offline (pen and paper) mode. Number of times: CBSE used to conduct NEET once a year. From 2019 onwards NTA was supposed to hold NEET twice a year, in February and May. NTA also announced exam dates. NEET 2019 February exam was supposed to be held from 03 Feb 2019 to 17 Feb 2019, and May exam was supposed to be from 12 May 2019 to 26 May 2019. However once again the exam will be once a year and now exam date is 05 May 2019. MBBS/Admission on basis of NEET 2019: If the exam was to take place twice a year, then admission was to be on basis of best of two scores. Nevertheless, as exam is only once now, therefore MBBS/BDS admission 2019-2020 will be on basis of NEET 2019 Result only. The creation of NTA was suggested during the meeting of Union Cabinet in the year 2017. The NTA is an autonomous and self-sustained organization formed to conduct the entrance exams for the Higher Education. According to the HRD Ministry, the CBSE and AICTE will be relieved from the responsibility of conducting the entrance exams so it can focus on the improvement of the education system and curriculum. NTA will help in making the entrance exam more student-friendly, scientific, open and have leak-proof systems. What will not change from NEET 2019? Mode of paper – Previously, the exam was paper/pen-based. The students would mark the answers in the OMR sheets. But, from the coming year, the mode of examination was supposed to be “computer-based”. As many students who appear for the examination are from the rural parts of the world and they are not familiar with the computer-based test, so the NTA was to set up test centres in various parts of the country. Through this, the students would have gained hands-on experience of the examination. Exam to be conducted twice a year – The NEET examination was conducted only once a year. But from the upcoming year, it was supposed to be conducted twice a year. Then the exam would have been be conducted in the month of both February and May. Appear for both the exams – From the next years, NTA would have allowed the candidates to appear for both the exam sessions. This would have been a huge relief for the students as they could appear for both the test and in whichever session they perform the best, that would have been considered for the admissions. So, they would not have had to take a year drop and prepare for NEET anymore. Twice a year – If the exam was conducted twice a year from 2019, candidates would have got one more chance to improve their score for the examination. They would not have to worry over their weak marks and drop a year for preparation for the next year anymore. Best marks will be considered – The students would have got a chance to appear twice in a year for the NEET examination. The paper in which the candidate scored better would have been considered for admission. So then the candidates would have had an opportunity to improve their marks. If you have any queries on NEET 2019 changes / new rules, please ask in comments below. How many time it is allowed to give neet?? There is no attempts limit in NEET. In 2019 neet conducting twice??? please provide model exam papers in online mode. and specify the website. thank you.